As a bit of an experiment in publishing, I went and wrote up a recipe for Stew with stout and chocolate on Medium. Number 1, then, is a dark brown, beef stew. It’s made in my favourite way for stew—with beer—and though a little bitter, was very flavoursome and enjoyable. Read it over in the Munch Munch collection on Medium, here. I made salmon for dinner tonight, and had spinach and pine nuts to to cook up on the side. In the end the side turned out really nicely, so here’s the recipe. Slice the onion, finely chop the garlic, ginger and chilli. On a medium heat fry the onions, garlic, ginger and chilli together until the onions brown (about 10 minutes.) Turn down the heat a little, then throw in the spinach, pour in the orange juice, and a few splashes of the balsamic vinegar. Add the pine nuts, then gently lift mix the leaves into the oil and sauce, and allow the leaves to wilt. Stop before the leaves are reduced to mush, serve on the side. It was delicious, the onions were sweet, and the chilli gave it just a little bit of interesting heat. “Mmmm”. “Oh God”. “I will die”. “Die-abetes, you mean”. Just a few of the choice phrases uttered through mouthfuls of chocolate by friends and colleagues on trying these morsels. This take on a brownie is so rich that a slab baked on a Monday should last until Sunday, disappearing one sticky slither at a time with cups of tea. I have previously ranted about the qualities of the ideal brownie and, until this recipe came along, I thought I had it sussed. But adding a decadent layer of salted caramel here elevates this cake above and beyond anything I had thought possible. Try it. You’ll never go back. Slice into small squares with a sharp knife. I find this this brownie is so gooey it is best served straight from the fridge and it’ll keep there happily for a week in an airtight container. My friends will tell you that I’ve been throwing together big vegetable lasagnes for quite a few years now, but this weekend I think I’ve gone and set a new personal best. Deep tomato sauce, rich caramelised vegetables and strong, smooth cheese sauce on top. I really wish that there were still leftovers to tuck into as I write this, but it didn’t survive past Monday lunchtime. It’ll definitely be back on our menu soon, and I’d love to hear any ideas for what you like in your veggie lasagne. 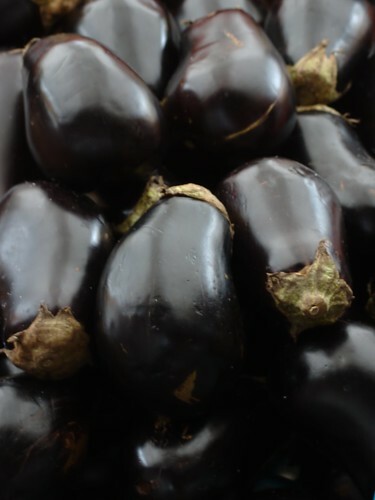 Is there anything better than roasted aubergine in a nice tomato sauce? I love a good beefy lasagne as much as the next red-blooded individual, but I think that my preference may finally have swung the way of the vegetable when it comes to this dish. I really need to persuade Ben and David to write more frequently about BBQ beef ribs, the perfect mole sauce and other delicious umami things like that. Any munchmun.ch reader would think we’re trying to give them diabetes. Oh well, here is a pavlova recipe I’ve been working on over the last couple of weeks. Only give this a go if you’re on friendly terms with your dentist! Stir in the freeze-dried raspberries and the raspberry juice gently with a metal spoon. Don’t over mix – you want a swirled effect. Pipe the mixture onto your traced outline starting at the outside and spiralling in until you reach the middle. Pipe an extra two layers of mixture on top of the outer circle. Place in the oven and bake for 1½ hours. The low heat means that you’re really just drying out the meringue, rather than cooking it through. Remove from oven and carefully transfer to a wire rack to cool. Fill the shell with clotted cream, tip the raspberries on the top and sprinkle over the grated white chocolate. Consume and die of sugar. Fill the shell with clotted cream, tip the raspberries on the top and sprinkle over the grated white chocolate. Consume and die of sugar. I feel you have to respect a woman who regarded custard creams as sophisticated but repeatedly rejected my requests for ‘flashy’ party rings. This recipe is my attempt to find a middle-ground: somewhere between the baroque swirl-adorned custard cream we know and love and an altogether more modern mouthful. Place on a baking tray parchment lined with parchment and bake for 10 minutes (or until just starting to colour around the edges). Watch them carefully – they go from perfect to crispy in moments! Place the buttercream into a piping bag and pipe onto half of the biscuits sandwiching together with a second biscuit. These can be fragile little biscuits so a light touch goes a long way here. And there you have it, a batch of approximately 20 biscuits that will last for a few days in an airtight container or around 30 second if left unattended on a ‘special occasion’ saucer. I can’t remember why I decided to try and make a batch of custard creams. I think I caught sight of the lovely Hope & Greenwood confectionery cookbook on my Amazon recommendations (I haven’t bought it yet if you’d like to send a copy my way) and was overwhelmed with nostalgia for ten-penny mix-ups, blue panda pops and ‘special occasion’ biscuits presented on a saucer by my nan. Here is a great recipe for a light but flavourful summer stew. It’s based on a classic Spanish recipe called suquet de peix but with a few substitutions to account for our love of mussels, hatred of celery and what was available on the booze shelf. There’s a fair amount of preparation going on here but it’s worth it for the depth of flavour in the resulting broth (which mops up well with crusty bread) and I can guarantee you’ll be back for second helpings. • For the sauce, heat the oil in a saucepan. Add the shallots, leek, carrot, fennel, and garlic and fry for 10 minutes over a low heat until soft. • Add the tomato purée, chopped tomatoes, white wine and whisky and cook to reduce by half. • Add the chopped salmon and cod and cook for five minutes. • Add the stock, herbs de Provence, tarragon and cayenne pepper, then cover and simmer for 40 minutes. • Blend the mixture, then push through a sieve (this bit takes ages but be patient!). • For the stew, pour the sieved sauce back into a large saucepan and bring to the boil. Add the fish and vegetables and simmer for 3-4 minutes. The fish should be cooked and the shellfish open. • When cooked, stir in the double cream and mix through the parsley. • Stir in the lemon juice and season. Serve with crusty bread and salty butter. Here is a great recipe for a light but flavourful summer stew. It’s based on a classic Spanish recipe called suquet de peix but with a few substitutions to account for our love of mussels, hatred of celery and what was available on the booze shelf. There’s a fair amount of preparation going on here but it’s worth it for the depth of flavour in the resulting broth (which mops up well with crusty bread smothered in salty butter) and I can guarantee you’ll be back for second helpings. For the sauce, heat the oil in a saucepan. Add the shallots, leek, carrot, fennel, and garlic and fry for 10 minutes over a low heat until soft. Add the tomato purée, chopped tomatoes, white wine and whisky and cook to reduce by half. Add the chopped salmon and cod and cook for five minutes. Add the stock, herbs de Provence, tarragon and cayenne pepper, then cover and simmer for 40 minutes. Blend the mixture, then push through a sieve (this bit takes ages but be patient!). For the stew, pour the sieved sauce back into a large saucepan and bring to the boil. Add the fish and vegetables and simmer for 3-4 minutes. The fish should be cooked and the shellfish open. When cooked, stir in the double cream and mix through the parsley. Stir in the lemon juice and season. I’ve been planning to make some Sloe Gin, but as the berries won’t be ripe for months the project is on hold. In the mean time we’ve acquired rather a lot of plums (from a friends garden), which Becky has been converting in to plum jam and I’ve been mixing up with some gin. 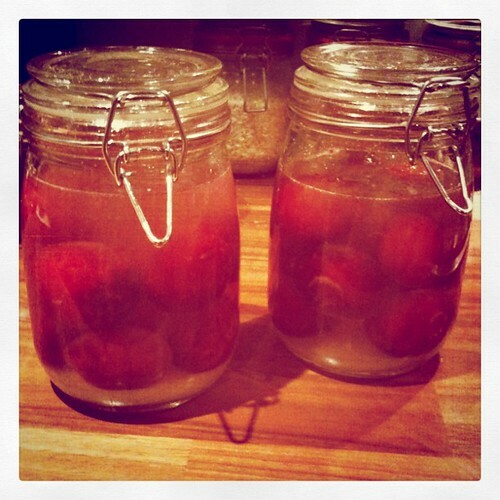 I looked at a few recipes, all much of a muchness of plums + sugar + gin with varying quantities. In the end I used this recipe, straight forward and well written. Everything came together really easily, probably less than 10 minutes work. The two large Kilner jars are going to get a shake every day for the next week then popped in a dark cupboard for a few months, right in time for winter. Exciting! Having just harvested this year’s crop of potatoes and eagerly awaiting our slow-growing beetroot and ripening tomatoes, I was particularly interested in this graph published by National Geographic. It shows how, in America, people have come to depend on a handful of commercial varieties of fruits and vegetables and thousands of heirloom varieties have disappeared (approximately 93 percent of varieties became extinct in the 20th century). I’m certain the story is pretty much the same in the UK and I’m left wondering how we can prevent further loss in future. I know it’s a small step, but we’ll certainly be sourcing our seeds from a Heritage Seed Library next year. We’ve often mentioned cookbooks and blogs that we love on munchmun.ch but here’s a delicious little magazine that deserves your utmost attention: Fire & Knives Food Quarterly. It’s a beautiful publication I’ve only just recently discovered and I’m pretty excited about it. This ‘new writing for food lovers’ is totally different from anything else on my bookshelf, the main difference being it won’t get covered in smudges of cake batter or dribbles of lemon juice as it contains no recipes. This is a tiny book of bite-sized essays about food, eating, memory, flavour and the culture of the kitchen. The list of contributors is intriguing. For example, in the latest volume the editor, Tim Hayward, has curated accounts by Tom Alexander, Mina Holland, Tom Parker Bowles and seventeen others. My favourite piece in edition No.7 is David J Constable’s moving ode to the Scotch egg. Now, I’m vegetarian but after reading this romantic, passionate description of the traditional picnic treat I’ll admit that I felt I could return to the meatier side of life. Frankly, the pickled onion can slowly suffocate in its jar of vinegar, mouldering on the back shelf of a bar, and the pork scratching – that disfigured popcorn parody – can have the award for swollen, artery-clogging obese morsel. And you, pork pie, you mahogany-coloured savoury confection only appreciated in the North, you can remain the highlight of the farmer’s snack. All pale in significance alongside the Scotch egg. ALL. This spherical delight, then – like a model assembly of the sun – beautifully designed and crafted and oohhhh, that memorable meaty aroma to treasure, as if God were to fart. It’s a winner, always has been. A masterpiece returned. Not only is the writing interesting and inspiring but the quality of the graphic design, typography and layout (check out the image from the endpapers below) makes Fire & Knives a foodie periodical worth collecting.